It is Railway Minister Lalu Prasad Yadav’s second budget that has not hiked fares. This time he has cut fares instead: air-conditioned first class by 18 per cent and air-conditioned second class by 10 per cent. It is one of those times when one can set aside the saying “justice delayed is justice denied” — temporarily. Instead, this is a case of “better late than never”. The perpetrators of the Best Bakery massacre were so well entrenched at one stage that it was thought by many that they will never get punished. When a fresh red cherry hits the hard brown deck at Nagpur for the first Test against England, there are going to be some fresh faces in the field too. Sourav Ganguly’s walk back to the pavilion was taking a real long time, but he has finally got there. Zaheer Khan and Ajit Agarkar both looked as if they would benefit from some shade too. The selectors have laudably decided to jettison them to induct four deserving youngsters, two of whom have not even played one-day internationals. Who killed Jessica Lall? Not known. Why was she killed ? Not known. With what weapon was she murdered? Not known. What happened to the weapon? Not known. Why did the police arrive very late on the scene despite it being near a police station? No answer. With bird flu in the air and stories in the media flying faster than the avians, birdwatching has overnight turned into a national pastime. Our cricket-crazed countrymen are suddenly more busy counting the number of roosters falling, than keeping score of wickets falling. IN the last four years our government’s single-minded focus on economic revitalisation has started showing results. Recent economic indicators prove that the state’s economy is moving towards a phase of high economic growth. Prime Minister Manmohan Singh must have had reason to let the chief of our nuclear establishment, Dr Anil Kakodkar, draw the line for the USA on the separation of civil and military uses of nuclear energy. In his press interview, Dr Kakodkar has expressed his concern at “the change of goalposts” in the American stand on where the line has to be drawn in the Indian nuclear establishment between these two uses. The Corps of Signals, one of the most important arms of the Army, last week celebrated its 95th Raising Day and the 13th post-independence reunion. The celebrations were inaugurated by the Signal Officer-in-Chief, Lt Gen Davinder Kumar. It is Railway Minister Lalu Prasad Yadav’s second budget that has not hiked fares. This time he has cut fares instead: air-conditioned first class by 18 per cent and air-conditioned second class by 10 per cent. Such concessions in the past would have earned the Budget a “pro-rich” tag, but the Railways has its compulsions: high-end passengers have been increasingly deserting it to fly by budget airlines, which offer better services and are more reliable. For too long the Railways has disregarded the quality of service and is now feeling the heat as passengers have got a choice. To show his concern for the poor, Mr Yadav plans to float a subsidised air-conditioned “Garib Rath”. Although the average passenger fare per kilometre in India is less than half of that in China, it is the high freight rates that are driving away goods traffic to truckers. The road route, however, is environment-unfriendly. The Budget attempts to woo back passengers, but fails to reduce the freight rates. The only welcome concession, however, is the 8 per cent cut for petrol and diesel, which will help contain price rise and may delay a possible petro price hike. Also laudable are the steps to build dedicated freight corridors, allow double decker and private containers and raise the number of coaches on trains. The idea to turn the Rail Coach Factory at Kapurthala into a PSU deserves a serious thought. The unaddressed problems of delay and high cost of transportation will, however, continue to dog the Indian industry. Despite a good turnaround, the Railways need to shed flab (staff account for 53 per cent of the Railways’ working expenses), avoid populism in the announcement of new trains and projects, speed up the execution of ongoing projects (Rs 48,000 crore worth projects are pending) and restrict itself to its core business (why not corporatise production units and privatise printing presses and clothing factories?). The Railways needs to rediscover itself keeping in view the demands of a growing economy. The success trains like Shatabdi have refurbished the Railways’ image and also raised public expectations from it. It is one of those times when one can set aside the saying “justice delayed is justice denied” — temporarily. Instead, this is a case of “better late than never”. The perpetrators of the Best Bakery massacre were so well entrenched at one stage that it was thought by many that they will never get punished. Well, after living comfortably in Narendra Modi’s world for so long, they have been finally brought back to earth with a Mumbai sessions court on Thursday sentencing 10 persons to life imprisonment. The sense of vindication that the news has brought is tinged with the realisation that seven others have been acquitted. Still, it is a landmark judgement, considering that it generates optimism about the outcome of many similar cases and in a way restores some faith in the judiciary which was rudely shaken yesterday in the Jessica Lall’s case. Since the Modi government was playing a brazenly partisan role, the punishment handed out to those guilty of setting on fire the Best Bakery in Vadodara on March 1, 2002, during the post-Godhra riots, killing 14 persons, is a feather in the cap of the judiciary and the votaries of human rights who fought a pitched battle against the state highhandedness. What must be remembered is that the case was first tried in a fast-track court in Vadodara which had acquitted all the accused in July, 2003. So, what has happened in this period for such a turnaround? For one thing, the Supreme Court has come down heavily on the whitewashing tactics and has moved the cases outside Gujarat. In fact, the judgement to some extent washes the stigma off the face of the criminal justice delivery system in India. But more needs to be done. There are others guilty of equally heinous crimes who are still roaming free. The law has to catch up with all of them if the shaken faith of the right-thinking people, particularly the minority community, is to be restored. Questions also ought to be asked about the circumstances under which prime witness Zahira Sheikh, whose family was burnt alive in the Best Bakery torching, turned hostile. The role of politicians and policemen has been shameful. A thorough investigation will also have a bearing on notorious cases like the Jessica Lall murder in which, shockingly, all accused stand acquitted. The youngest of them is 17-year-old Piyush Chawla from UP. He has impressed with both bat and ball in the handful of first-class matches he has played, with three five wicket hauls and three half-centuries. What is more, he is a left arm, leg break bowler, that most special breed of cricketers. If he can come good, it can only raise the profile of Indian cricket. As for Chandigarh lad VRV Singh, he has already earned the reputation of being a genuine quick. He has surprised visiting batsman in first class fixtures with both speed and movement. The other two, Suresh Raina and S. Sreesanth, have performed well in their ODI outings, and are deserving of a Test break. The search for a partner to Sehwag continues, with Gambhir justly making way for Wasim Jaffer, who has had to spend much of his prime sitting out. Here is a chance for this elegant batsman to cement his place as an opener. Hopefully, all these youngsters will get a chance in the playing 11 for the three-Test series. If they make the cut, fans might well be getting glimpses of a future Indian team in the making. Deciding just when to expose talented youngsters to the demands of cricket at the highest level is indeed a tricky affair. Late-bloomers notwithstanding, there is something about class that itches to be discovered early. And let’s not forget the World Cup is not far off. Who killed Jessica Lall? Not known. Why was she killed ? Not known. With what weapon was she murdered? Not known. What happened to the weapon? Not known. Why did the police arrive very late on the scene despite it being near a police station? No answer. What happened to the bloodstained clothes of the victim? Not known. What was the car by which the culprit/s escaped? No idea. Why was the place of offence cleaned up before the police arrived — to entertain another batch of customers? Don’t know. And why no action was taken against the owner of the premises? Not known. Many more questions about the ghastly incident under bright enough lights in a restaurant filled with scores of well-to-do educated people of the capital city remain unanswered after seven years of investigation by a crack team of the Delhi police and a 180-page-long verdict! All that is known today is what was known on April 30, 1999, — that Jessica Lall was well and truly dead. The public has the right to ask — what sort of criminal justice delivery system are we having and is it worth having? Any civilised administration sensitive to public sentiments should have placed the investigating officer under immediate suspension — for he exhibited gross incompetence and dereliction of duty by presenting such a shoddy charge sheet, or for “framing up” Manu Sharma as held by the Judge. This is not the only case where the public is shocked by the sheer inadequacy of our criminal justice administration. Delhi and surroundings and the rest of India have too many such. Nor have we seen the last of the kind. Our system depends heavily on the police to investigate the crime and prosecute the offenders. That inevitable foundation has never been strong. That is the reason why statement given to a police officer during the investigation is not “evidence” acceptable to century-old laws like the Criminal Procedure Code or the Indian Evidence Act. Hence witnesses can change their versions with impunity when they appear before the court and give evidence under oath — in other words they turn hostile. “….In all offences punishable with 10 or more years imprisonment, including offences for which death sentence can be awarded, the police shall have the statements of all important witnesses recorded under Section 164 by a magistrate. Indeed, it would be more appropriate if this is done at the earliest opportunity i.e. at the very inception of the investigation. It is well-known that generally witnesses stick to truth at the early stages but may change in course of time”. Respecting these suggestions, Bill No.40 of 2003 was introduced in the Rajya Sabha by the then Home Minister on August 14, 2003, to amend the relevant laws. It was proposed to amend the IPC to make giving of false evidence or inducing any person through any means to give false evidence, offences punishable with imprisonment up to seven years. The CrPC was also sought to be amended by introducing provisions for recording of statements of witnesses before magistrates as repeatedly recommended by the experts. The statement so recorded under oath, was a guarantee against witnesses turning hostile. Unfortunately, this Bill, when it became a law in 2006, lost all its teeth. Perjury was made an offence, but turning hostile is not perjury. There have been debates about the need for a comprehensive systemic changes to our criminal law machinery which is based on the English common law adversarial system. Under this system the prosecution has to prove the guilt of the accused beyond reasonable doubt. Therefore, in India, all that a successful defence lawyer has to do is to create doubt by picking holes in the prosecution story — often with the cooperation of the police. The alternative system, namely the continental system or the inquisitorial system of law prevalent in France and other continental countries, has many features that are at once attractive. Under that system unearthing truth is the aim of investigation — not just trying a set of accused on the basis of available evidence. In practical terms, if Jessica case were to be tried in France the prosecution would not rest content by pronouncing Manu Sharma not guilty. There the investigation would not end on any technicality until the murderer is found out and the exact mode of commission of crime was established. Technical rules of evidence are of little importance. There the accused has no right to remain silent, and he has to give his version of the case on being questioned. Investigation is done under the supervision of a judge who will prepare a dossier containing material collected from all sources, including the police working under him. A different judge would take up the trial. The continental system does not require the proof beyond reasonable doubt — if the Judge’s conscience is satisfied that someone is guilty, he is sentenced. The Justice V.S. Malimath Committee undertook an elaborate exercise to find out how much of the continental system can be adapted to suit our conditions. Fortunately, Western Australia which was also under the common law system had with considerable success adopted the continental system to certain classes of offences. The Malimath Committee recommended several measures adapting the continental system and declared that the aim of the criminal justice system is the discovery of truth and not just evidence to prove the guilt. Several suggestions have been made to make the law flexible for unearthing the truth. The victim of a crime was given right to engage a lawyer and participate in the trial — the victims’ rights were recognised generally. This would avoid the complaint of inefficiency or dishonesty against the public prosecutors. One newspaper while dealing with the Jessica case had a heading “With prosecutors like this, where is the need for defence”. If Jessica’s family could engage a lawyer, such a complaint would not have arisen. Malimath report is — like many others — gathering dust. “Everything has been said already, but as no one listens, we must always begin again”. The writer is a Senior Advocate, Supreme Court of India. But birdwatching — the kind that is done not out of a scare but when one has time to spare — doesn’t come naturally to all. This I realised a few years ago, during a trip to the Gajner Palace, near Bikaner. It was the peak of winter and the lake on this heritage property was teeming with migratory birds. What I thought would be a purely recreational trip, had all the makings of an educational tour. For, along with bites of “lal maans” and smoked kebabs, the guests were dished out sound-bytes on flamingoes and cranes by a visiting ornithologist. But with the regal repast keeping the taste buds busy, having to devote one’s ears to descriptions of the imperial sandgrouse didn’t give much cause for grouse. In fact, the lecture was digested so well by some members of my group that they racked their brains to shoot really bright questions. The company was truly ‘bird-brained’. Some fellow tourists were even inspired to borrow professional telescopes to zoom on the plumed creatures. Soon after, the entire group split. There were those keen on heading to the backwaters to sight the winged visitors from close quarters. The bird expert was only too glad to take them under his wings. And there were the less bird-besotted, who preferred to be on the fringes, cooing to the feathered friends from the edge of the lakeside restaurant. It was to this fringe population that yours truly belonged. The farthest we went in displaying an interest in bird species was to walk up to a stone enclosure in the palace. It was here that the birds hunted during the shikar parties of former rajas used to be displayed. Bearing testimony to the avian history of Gajner were names like gadwall, pintail, mallard and redcrested pochard etched on the concrete floor. But it was the other group that had more concrete plans. For the next few days, at the crack of dawn they’d venture into the sanctuary behind the palace that took them to the rear end of the lake. This secluded place was ideal for getting up close and personal with the birds. After their arduous treks, they’d return to the palace hotel to regale the rest of us with tales of encounters with pintails. However, on the last evening of our stay, the cheerleader of the birdwatchers’ brigade looked rather listless. The trysts with the twittering species seemed to have dulled his chirpiness. Enquiries revealed that he was down with a running nose and fever. The bird spotting in the nippy, early morning January breeze had given him a chill. Now, that was one flu that could be blamed squarely on the birds. When my government assumed office in 2002 the state’s financial situation was in total disarray. We inherited empty coffers and a huge debt of Rs 32,496 crore to be serviced. To restore the financial health of the state, the government had to implement strict financial self-disciplinary measures. To put the state’s fiscal in order, a number of far-reaching reform measures have been implemented and are under way. The Budget 2003 incorporated a road map for fiscal reforms. Steps were taken to smarten up tax administration, power sector reforms enforce uniform floor rates of sales tax, conforming to the national consensus in respect of tax incentives for industry and efforts were made to compress non-productive expenditure with a view to improving fiscal management. The Punjab Fiscal Responsibility and Budget Management Act was enacted by the government, which has been amended in 2005, to bring it in line with the recommendations of the 12th Finance Commission. The Bill provides for a phased reduction in revenue deficit, fiscal deficit and also a proposal to cap public debt and state guarantees. For attracting private investment in infrastructure development, the Punjab Infrastructure Regulation and Development Act has been amended. The Act provides for a level-playing field for all players in infrastructure development and also provides for a strong regulatory authority, being a fair arbitrator among them. To tackle the problem of high-cost debt, our government swapped the costly debt of over Rs 5,329 crore carrying coupon rate exceeding 13 per cent with low cost debt from 2002-03 to 2004-05. This has enabled the state to reduce the interest outgo of Rs 339 crore per annum. As a result of these fiscal initiatives, the fiscal deficit of the state has come down from Rs 4,958.97 crore in 2001-02 to Rs 4,114.94 crore (pre-actual) in 2004-05. In the same period the revenue receipts increased from Rs 8,928.62 crore to Rs 13,807.48 crore. This is expected to increase to Rs 17,238.13 crore. We now aim at achieving, rapid industrialisation in the state through coordinated development of its small, medium and large-scale industries. A well-developed agrarian base combined with a favourable industrial environment would result in growth of business opportunities, give impetus to trade and create vast employment opportunities. Punjab’s strong foothold in the agricultural sector has given commodity trading the much-needed platform to gain momentum. Moreover, with the entry of new commodities ranging from gold, silver, crude to agricultural commodities like wheat, rice, guar seed, urud dal, chana, jeera and menth oil, commodity trading will increase stupendously. Correspondingly, commodity trading is becoming universal all across Punjab extending from the major trading centres of Amritsar, Jalandhar, Gurdaspur, Kapurthala and Batala to the smaller markets like Kanak Mandi, Lohgarh, Manjit Mandi etc, thus giving ample opportunities to traders to expand. For Punjab to grow from the granary of the country to the biggest commodity future’s market, the government has constantly tried to improvise and the principal initiative undertaken to help the traders was the implementation of the Value Added Tax (VAT) from 2005. The Bill was passed keeping in mind the interests of the business and trading community. The Punjab Council of Ministers announced concessions worth Rs 350 crore for farmers, manufacturers, exporters and customers by removing certain items from tax slabs of 12.5 per cent and 4 per cent to zero per cent. All sorts of salts, gur, jaggery, mechanised agricultural implements, green tea, khadi garments, bangles etc were put in the tax-free category. Our government went out of its way to remove all difficulties and apprehensions of the trading community for smooth implementation of VAT. VAT on 52 items was slashed to 4 per cent and many more commodities were exempted from the purview of VAT. Despite this the revenue collection went up by 35 per cent. Likewise, the state excise collection during the last three years was Rs 5,903.31 crore as compared to Rs 6,254.27 crore collected during the five years of the previous government. In all, sales tax/VAT collections during 2002-05 (up to December) amounted to Rs 13,960.18 crore as compared to Rs 10,196.82 crore collected during the five years of the previous government. Vigorous efforts have been made to increase the credit flow from banks and other financial institutions to trade and industry, including agro-based industry. The Department of Industries and Commerce has constituted a committee under the chairmanship of Principal Secretary, Industries & Commerce, including senior functionaries of major banks and financial institutions in Punjab as members to monitor the credit flow to the industry. A state-level committee has been constituted to remove grievances of entrepreneurs and traders. Two industrial clusters — a textile cluster in Ludhiana and a woollen garments cluster in Amritsar — under the “Industrial Infrastructure Upgradation Scheme” have been sanctioned. Another vital development has been the abolishment of Inspector Raj by the Department of Industries and Commerce. The Industrial and Trade Promotion Council will rather perform most of the regulatory functions to make the system more people friendly. The region has leapfrogged into the next fiscal with the annual plan pegged at Rs 4,000 crore, inclusive of an additional central assistance of Rs 100 crore, for projects of special interest to the state. The investment of Rs 3,500 crore had been received till November, 2005, and industrial exports increased from Rs 4000 crore in 2001 to Rs 12,000 crore in the current year. 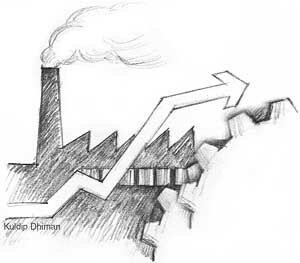 Industrial Production has increased by over 25 per cent during the last three years. The decision of the state government to set up a Punjab Investment Commission is further expected to increase the pace of industrial investment in the state. These are sure signs of economic regeneration in the years to come. The concern is mainly on the inclusion of the proposed fast breeder reactors and certain other facilities in the civilian category that the US is insisting upon. Once that is conceded, India would be deprived of both weapons grade plutonium and highly enriched uranium it needs for maintaining the “minimum credible deterrent”. The core of last October’s understanding between the Indian Prime Minister and the US President in Washington was letting India retain this level of deterrent in exchange for bringing all its civilian nuclear establishment under international safeguards. By shifting the line of demarcation into the source of the nuclear weapons grade material, the US Administration would be indirectly asking India to cease to make any more nuclear weapons. If such a demand is conceded, India will surrender its right to maintain such a deterrent. This is an unacceptable situation for India. However, there is more to Dr Kakodkar’s concern than mere weapons grade plutonium or uranium needs of India for maintaining its security. The US, obviously under pressure of its own non-proliferation and nuclear energy industry lobbies, is asking for a slow down, if not halt, to the in-depth nuclear research and development in the country. India has already demonstrated the highly sophisticated technology needed to separate plutonium, use it efficiently in a fast breeder and also convert thorium. Besides it has built the robots and developed automation processes that are needed to handle such conversion processes occurring at high temperatures and pressures and generating high levels of radiation. The engineering of the fast breeder reactors has been mastered and a number of 500 MW fast breeders are on the design stage. As for thorium, an advanced heavy water reactor that could use thorium even skipping the fast breeder secondary stage, is under design. Under the proposed Indo-US treaty, these facilities should come under the civilian category and therefore under international safeguards. If that were conceded, the plutonium needed for weapons would have to be found from other sources, implying that some new reactors would have to be built. Though this constraint could be overcome, the US intentions are not to merely separate the civilian and military. The Indian nuclear establishment suspects that the US would not like India to go in for fast breeders. It might insist on closing down the present programme of building five fast breeder reactors to be completed by 2020 — the first one should be ready by 2011. Or it might insist that everything connected with the fast breeder would have to come under safeguards, denying any material for weapons purposes. If plutonium is denied, how could the deterrent be constantly upgraded to a minimum level? Consider the enormous research on handling of radioactive materials like plutonium and the material science that India acquires. The fast breeder test reactor at Kalpakkam has given India a lead in material science to the chagrin of advanced countries. Scientists and engineers from these countries visit Kalpakkam for learning these technologies. These technologies like non-destructive testing, online testing of components, surface coating to achieve flexible tolerances, etc. have a huge impact on industrial capacity and in enhancing India’s industrial competitiveness. Should all these come under international safeguards? It would raise many complex questions of intellectual property rights, commercial secrecy etc. Many of these technologies are for dual purpose and could be targets for western powers seeking to limit India’s capabilities in non-civilian and industrial areas. If fast breeders will not be built, there will be no investment in developing these technologies. There is also the US self-interest in the proposal to cooperate with India — the US industry’s hope of winning large contracts for setting up nuclear reactors and power generators in India. For India, cooperation opens the way for import of large quantities of lightly enriched uranium whose international price has fallen steeply in the last few years. The crucial question is, whether the price that the US would ask for such cooperation would be the abandoning of the FBR programme or bringing the entire R&D that leads to it or results from it also under international inspection and veto of one kind or another? The Corps of Signals has made rapid strides in establishing a world-class information communication technologies (ICT) infrastructure and also acquired capabilities to negate the same with our adversaries through effective use of electronic warfare and signal intelligence. The two major projects, Mercury Flash, a strategic broad band satellite network and Mercury Streak, a mammoth project involving laying of the optical fibre cable, were commissioned last year. The availability of such ICT infrastructure will make the Army “network enabled” in consonance with its vision and doctrine. The Corps is concurrently working on organisational transformation and HRD requirements to ensure that they have both matching organisations and skill sets. The establishment of real time network management through well-dispersed network operation centres and data centres for information storage/management are the additional challenges. Mrs Anupma Singh, wife of the Chief of Army Staff, Gen J.J. Singh, and President of the Army Wives Welfare Association (AWWA), has handed over a specially modified school bus to the children of Asha School which takes care of children. The bus has several unique features which make it very useful for special children with various disabilities. The bus has a special hydraulic system lift to facilitate boarding of children on wheelchairs. Four such wheelchairs can be fixed inside the bus with safety locking systems. The bus was donated by Ashok Leyland. Asha Schools for Differently Abled Children are located in almost all major cantonments in the country. They seek to provide specialised care for disabled children with a view to making them physically self-sufficient, developing vocational skills, and releasing their latent potential to the fullest degree possible. As part of its adventure activities, the Army is all set to undertake a hot air ballooning expedition from Jaipur. It will be a very different hot ballooning expedition as it will be a day-night affair which will make the manoeuvering of the balloon difficult. Besides, another unique fact about this expedition is that it will be undertaken in the biggest-ever hot air balloon in the Indian history. Army officials say that this balloon will be three times the size of the balloon which is normally used in hot air balloon expeditions. When Mr Patel got up to give his ruling on the Public Safety Bill, two bombs fell from a gallery near the seat of Sir George Schuster. The whole House dispersed at once in panic. Sir George Schuster and Sir B. Dalal were slightly injured while some other members also received minor injuries. Two men have been arrested with pistols and revolvers. Ten minutes later the Assembly reassembled. The Chamber presented awful scene as it was choked with bomb smoke. Mr Patel adjourned the House till Thursday next. A red pamphlet “Hindustan Socialist Republican Army” signed by Bal Raj, Hony. Chief, was also thrown along with the bombs. The police immediately locked the Council House and prevented the movement of the visitors’ crowd. Sir J. Simon was in the President’s Gallery when the bomb fell. Sir G. Schuster, Sir B. Dalal, Mr Raghavendra Rao and Mr Shanker Rao were among those injured. The names of the arrested persons are Mr Butukeswara Datta from Bengal, domiciled in Cawnpore, and Mr Bhagat Singh from the Punjab. — A.P.I. Pandits sat and read the law babbled things they never saw. Sin would have increased if God had not made the sinner feel that he is responsible. One should fix one’s mind on God with loving contemplation after bringing the senses under control. One’s intellect becomes steady when one’s senses are under complete control. A Hindu believes that divine beings exist in unseen worlds.